Cars don't come more iconic than the Land Rover Defender - here is a vehicle that can trace its roots right back to 1948 and is still regarded as the most capable off-roader ever. Cars don't come more iconic than the Land Rover Defender - here is a vehicle that can trace its roots right back to 1948 and is still regarded as the most capable off-roader ever to hit the road (or mud). Originally designed after the Second World War, constant updates have certainly tried to bring the 4x4 up to modern standards, but you’d hardly class it as the most sophisticated model available. However, millions have been sold and it commands a following like no other car - the result is high demand and equally high values on the used market. The last time there was a major change to the Defender was actually back in 1990 - it’s now due for a complete replacement. However, it’s always been supremely capable, and offered in a series of different body styles. The most common are the five-door station wagon (called the One Ten) or three-door (Ninety) models - the numbers referring to their wheelbases. But if you want something a little different, then Land Rover has the answer - offering the Defender in two- and four-door pick-up versions (single- and double-cab) and a rather more commercial or farmer-friendly two-door hardtop in either long- or short wheelbases. 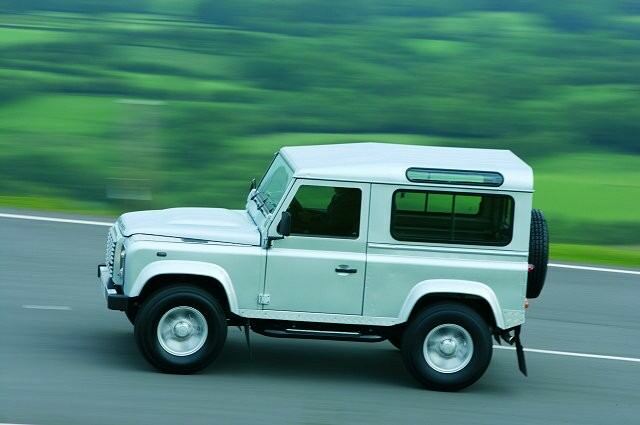 Whatever your needs, there’s generally a Defender to suit you - some even seat up to nine! There’s rather less choice on engines though, with the petrol-fuelled Rover V8 not being readily available here in Ireland. Almost all of the used examples you’ll find will have a form of turbodiesel engine under the bonnet; early cars came with 2.5-litre four-cylinder units and later models with more refined and powerful 2.2-, 2.4- and 2.5-litre five-cylinders. The latest models (2007 on) have six-speed manual gearboxes, but most on the used market will come with the five-speed manual. Four-speed automatics are best avoided as they are unrefined and ill-suited to the car’s character and capability. Trim-wise none are particularly plush; it’s best to expect functional and plain rather than luxurious and lavish. Whatever you choose expect to find a low-ratio gearbox and variety of locking differentials for the ultimate in off-road ability. By far the most useful model is the five-door station wagon, so we’d advise hunting for one of these first and foremost. It’s worth noting that the later models changed the rearmost seats for forward (rather than side) facing so now seat seven maximum rather than the previous tally of nine. Otherwise it’s the 122hp five-cylinder turbodiesel and manual gearbox that makes the most sense. Don’t be put off by an older model though, as mechanically they’re bullet proof and little different to drive from the latest - just check thoroughly for any chassis or body corrosion. If you’re looking at a Land Rover Defender, then chances are you’re not considering anything else - only the Jeep Wrangler could claim similar ability or heritage. The Defender isn’t as refined as more mainstream rivals, but it is far superior off-road and in terms of image and following. It’ll fit in with farmers and the moneyed alike, and there really is no other vehicle like it.